Most students we work with, not just those on the autism spectrum, do better with structure and predictability. Sure, curve balls happen and we need to prepare our students to handle those. But making Speech an enjoyable experience will make for easier transitions, fewer tantrums, thus, more progress. This year, I will be implementing use of a visual schedule. I bought this small bus sign from the Target Dollar Spot. (Read more about how I’m using other Target finds here.) I embellished it using my Silhouette paper cutter (affiliate link here). I added a strip of Velcro to bottom and it was done! So simple and so cute. For some students, pictures can be simple instructions, like the ones pictured above. Other students may prefer/require more specific visuals that include the exact materials they’re going to be using. 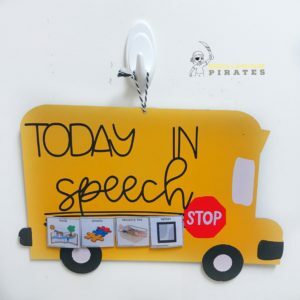 Speech schedules don’t just have to be for the little ones of those on the spectrum. 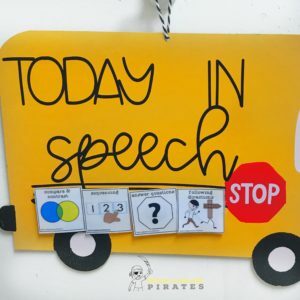 You can illustrate expectations for things like centers or a group session (and even keep yourself on track in the process) by giving specific pictures of the speech/language targets for that day. The schedule is placed on the wall right in front of my table, so it is clearly visible to the students throughout the session. I will be keeping all of my schedule’s visuals in this handy magnetic pocket. 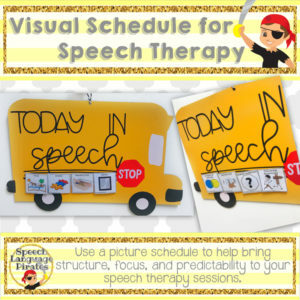 I decided to share my visual schedule pictures, as well as a couple simple schedule templates (if you can’t or don’t want to use the bus) in my TpT store. Find it here. 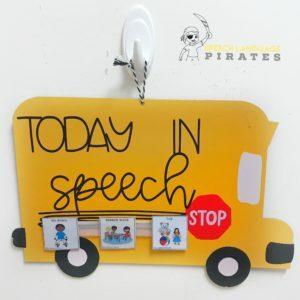 I hope that with the introduction of a visual schedule to their speech sessions will bring easier transitions, increased participation, order, and joy to my room. 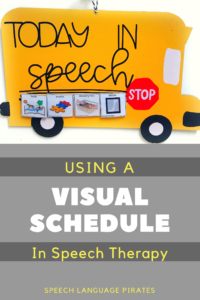 To grab a copy of my visual schedule pictures, as well as two posters to use as the base for your pictures, check out this resource. I also purchased an apple plaque. I personalized this for my door. 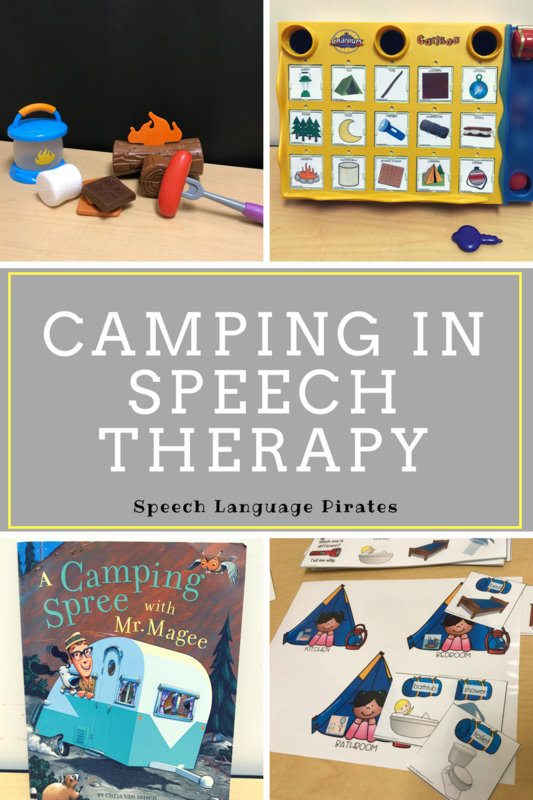 « Why SLPs should run to the Target Dollar Spot! Oh my gosh! WONDERFUL ideas! I would love to win a school bus!!!! This idea is so fabulous! I can’t believe I passed up a school bus! Fingers crossed! Love these ideas! So cute! Cute signs! Love the functional decor idea. Great great great idea! Love it and will be buying your pictures on TPT 🙂 Thank you for sharing! Can’t wait to purchase the visual schedule for this school year! Great for students who anticipate transitions! I am just starting a new job as a CF and would LOVE either sign! Love the idea of the visual schedule as well 🙂 Thanks for all the great ideas! Love this! Such a great idea- would love a bus for my therapy room! 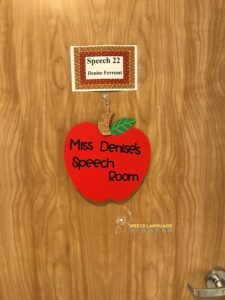 I think visual schedules are SO important in the classroom but I have not been using them consistently during my speech groups. I love this idea and you have inspired me! Thank you! I passed up the bus because I wasn’t sure how to use it. Now I need to go find one!! My email is edford@okstate.edu and I would love a sign! Love how you turned the school bus into a visual schedule and store all your manipulatives in a clear folder. I need to do this in my room – hoping I can find a school bus at Target! My students would love it and find it highly motivating. I would also love the bus! This is a great idea! These are so adorable!!!! Even if I don’t win, I’d love to be able to contact you and possibly purchase the vinyl designs!!!! How adorable! I love the name sign and visual schedule idea!! Would love to use your ideas… I use visual schedules all the time… nice to have some fresh ideas! I will be following your blog! Thanks for sharing and for your TPT MATERIALS! I love this! I regret not getting one at Target and now they don’t have it! Thank you for your fabulous ideas! So ch a great idea! Love the bus and apple! You have such great ideas! I actually passed on the bus too bc I wasn’t sure how to incorporate it. Thanks for sharing!! I love these ideas! 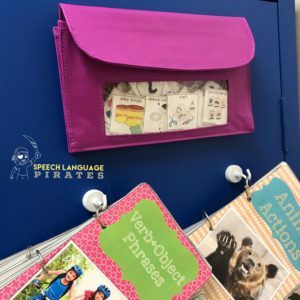 I have been trying to incorporate daily speech schedules into my routine more often (as in, for more than just students with ASD). Thanks for the ideas!! Awesome ideas! Thank you for sharing. I really like the school bus with the picture schedule! This looks amazing! Would love to have one as they are not available near me. LOVE, LOVE the bus visual schedule!! Thanks so much for the idea, making this for sure!! !